Justice in Tarot symbolises fairness, objectivity, responsibility, truth, reasoning and the law. It also stands for integrity. Integrity is a magic key that attracts success in your working life. Integrity is about being true to your values, beliefs and identity. It's about doing the right thing, because you know it's right. It's standing up for justice, truth and honesty, even if it means you are standing alone or ruffling some feathers. Even if you may have to face difficulties as a result. Having the courage to say no. Being happy to turn down offers and opportunities that don't comply with your values, beliefs and true self. Being authentic, genuine, pure, trustworthy. Without integrity you will lose respect and earn a bad reputation. When was the last time your integrity was tested in your working life? How did you respond? What were the consequences, and how did it affect you? 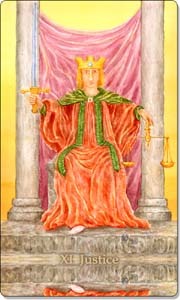 Tarot Magick: Use the image of the Justice card as a meditation tool, if you are having to deal with issues of integrity at work. Keep it in a prominent place and look at it often as a reminder to do what is right and follow your true path with conviction. "Knowing yourself is the beginning of all wisdom." Learn more about Tarot and discover yourself with my eBook, a 102-page book filled with inspirational quotes, affirmations and messages for each card. Your new website is fabulous, Christiane! I didn't know you could create a static home page with blogger. Well done! Will you be sharing business and marketing advice for small businesses on the blog? Yes, integrity can also mean having to give something up, letting something go if it's no longer right for you, rather than hanging on to it. Some people don't have the guts to do that and continue even though it makes them feel uncomfortable.